The north of the island is much more rugged than the south and features some breath-taking clifftop vistas and trails that are not so accessible by foot. There are a number of organised horseback tours around the San Joan and San Carlos areas that are fit for any level of horseriding experience; the main advantage being that you get to explore hidden parts of the island you would otherwise never see. You could take a canter along a deserted beach at sunrise or ride to the top of a jagged cliff top for sunset. Ibiza Horse Valley is located close to San Joan and is made up of a team of lovingly nurtured rescue horses who you get to wash and feed and interact with all day! A magical adventure indeed. The island has some stunning cycling trails that will take you up through the mountains, amongst forests and along some high sea-top paths. Ibiza offers a few different organised cycling tours which include bike hire, and range from a more sedentary meander along some nice flat paths traversing the island, to extreme mountain biking off-road adventures, designed to get the adrenaline pumping and your heart rate going! And, of course, it means you get to see parts of the island you would never discover on foot or by car. A great alternative way to discover the islands beauty. One of Ibiza's most infamous and accomplished international chefs, Sid Shanti, has recently taken on a brand new venture, Shanti Picnics. Using local ingredients sourced from Ibiza farms and foraged from the island, he now has an extensive picnic and lunch box menu, cutely boxed and delivered to the location of your choice. So pick your beach (or ask them to suggest one of their secret spots) and feast like a king on delicious and healthy food cooked by the fair hands of this Ibiza master. For a more thrilling view of Ibiza's most rugged of off-road landscapes, the E Move Quad Excursions have got it buttoned down. They host 3-hour guided tours through the hills surrounding San Antonio, passing by a couple of beaches for a swim along the way with a snack and a drink thrown in as well! You will see vistas and scenery that you would never find alone and will experience breathtaking views from clifftops all whilst tearing along the paths on a meaty quad! You'll be led in a convoy or up to 20 people and will experience the island's natural beauty from a whole new exciting perspective! Unbeknown to many, Ibiza is a hive of yogic activity with classes being held all over the island, every day of the week and at all times of the day! Whether you fancy a private class at your villa, a one-on-one session overlooking Es Vedra or an organised group tuition on the beach, you will definitely find whatever you are looking for. The spirituality of Ibiza is more than evident when you look at the range of teachers and styles. Yoga is deep-rooted in the heart of the island, so why not try it yourselves? The perfect way to stretch, unwind, relax and get your meditation on. If you're after something much more active, then perhaps a day at Ocean Mania is the one for you. Located just off the shore where Ocean Beach is situated in San Antonio Bay, Ocean Mania is Ibiza's first ever inflatable water park and provides enough exhilaration to last you all holiday! The massive floating obstacle course is over 7000 square feet in size and contains a ton of trampolines, beams, bridges and slides for you to tackle in action. 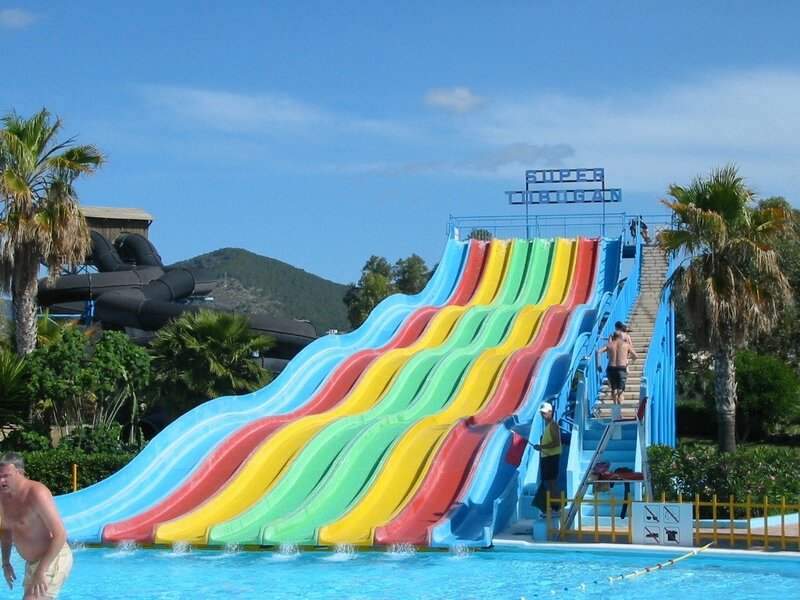 Kids and adults love it, so get fearless and go waterslide crazy! Yet another new mode of tour transport, the Hot Rods are taking the island by storm! “Party at Night, Cruise at Light' is the strap-line provided by the Hot Rod tours, and cruise you will in these head-turning and fun little automobiles! There are a couple of tours to choose from varying in length of time and time of day. You'll be guided along some of Ibiza's stunning back roads and through quaint villages in your stylish kart and they even have a sunset tour where the journey ends at a magical spot just in time for Ibiza's best natural show. Discover the island a different way! Ibiza Virgins Guide...what club to choose?